All laptop bags have their perks. Rainebrooke’s Metro-Traveler offers the unique option to personalize your laptop bag via embroidery, or basically however you like, since it is made out of 600D Nylon on the exterior. This makes it a great buy for the college and under demographic who needs to get clever pins and Sharpee laden slogans out of their system. It has remarkable padding, a little under an inch thick, to protect laptops of the young and spontaneous (ie… clumsy). This is a lot like a backpack reincarnated into a laptop bag. Overall, the design is a little chunky. The thick black line outlining the bag would be better if it were a light color matching the spectrum of pastels that the bags come in. A little embroidery and decorative effort should take care of this just fine though. Space in this bag is great. There are two interior compartments so you could fit a laptop, books and homework! Another zippered exterior compartment is very roomy and has about ten pockets for various uses. The outside of that compartment has yet another large velcro/zipper pocket. Also, shoulder strap is detachable. It fits most 17″ laptops, with plenty of room in the other pockets for more items. 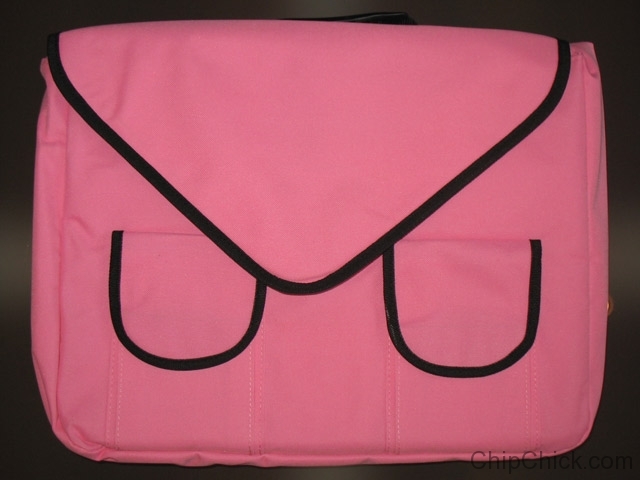 Metro Tech comes in 4 colors- Light pink (pictured above), hot pink, light blue, and bronze. It can be purchased at www.rainebrooke.com for $59.95. Compared with other designer bags, it is not as pretty, but for the price and how sturdy and roomy it is, it’s a decent buy for college/school age kids. This would even make a good back to school gift.